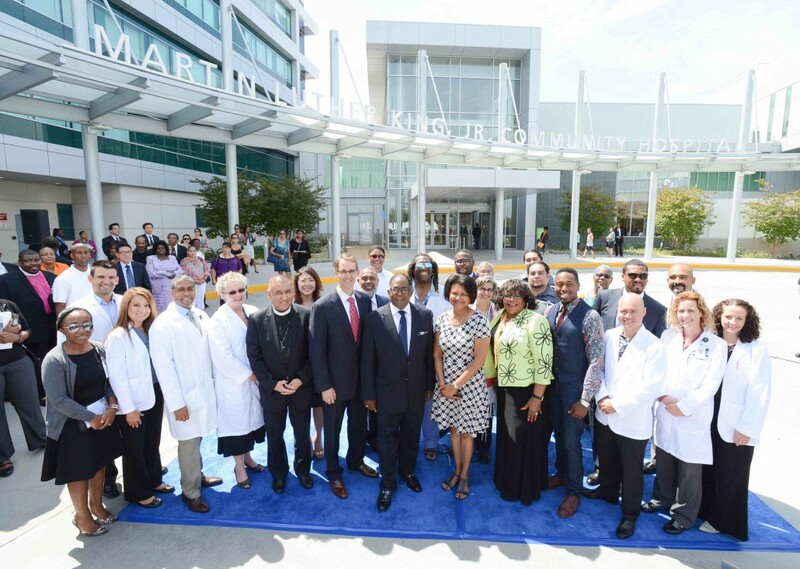 Supervisor Mark Ridley-Thomas and leaders of different faiths gathered Thursday to pray for the new Martin Luther King, Jr. Community Hospital, which is to be dedicated Friday. “We want God to bless this place,” the Supervisor said, before leading a procession of Christian, Muslim, Jewish, Buddhist and Native Americans in a ceremony to bless 131-bed hospital. The state-of-the-art facility, which cost $284 million to build, will provide general acute care, primary care, emergency services, and labor and delivery services. the City of Refuge Church in Gardena, Bible Enrichment Fellowship International Church, and Guidance Church of Religious Science. Representatives from the Islamic Center of Hawthorne, Higashi Hongwanji Buddhist Temple, Beth Chayim Chadashim, Churches for Action, Centro Cristiano LA., the Band of Mission Indians and the L.A. City/County Native American Indian Commission also said prayers. “May God fill us with love as we celebrate a new beginning in our community,” said Imam Omar Ameen of the Masjid Al-Shareef mosque of Long Beach. Bishop Juan Mendez of Churches in Action prayed for the hospital’s patients, “I pray for human kindness, a compassionate touch,” he said. Rabbi Lisa Edwards of Beth Chayim Chadashim focused on the hospital’s administrative and support staff: “May you know every day that you make a difference,” she said. The hospital is the centerpiece of a network of preventive care services on the Martin Luther King Jr. Medical Campus, which also features the Martin Luther King, Jr. Outpatient Center, Center for Public Health, and Mental Health Urgent Care Center. Construction is either underway, or planned, on a recuperative care center for homeless patients, a building for doctor’s offices, a medical hub for children, and a community garden. Around the campus, Metro’s Rosa Parks/Willowbrook bus and train stations are also slated for significant upgrades. So are the local public library, senior center, and Kenneth Hahn Plaza. Time Capsule Suggestions A New Day at MLK!